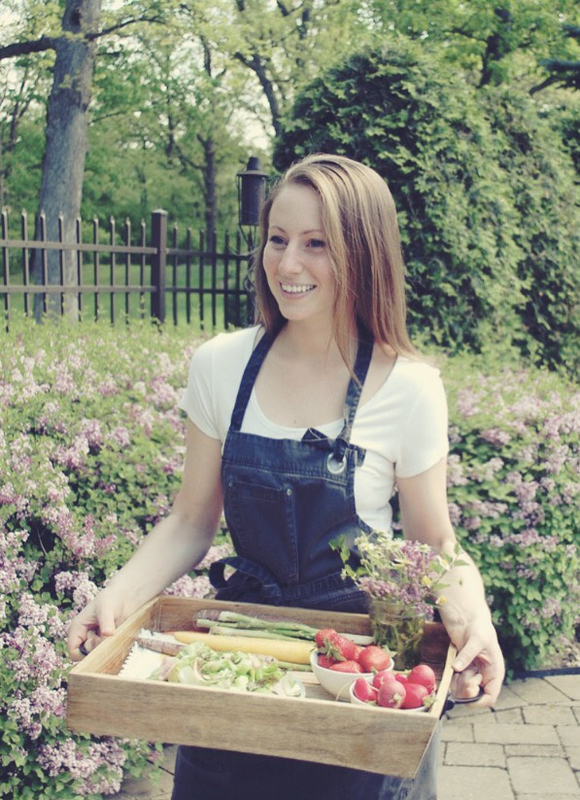 It’s mid-October and soup season is officially in full swing! 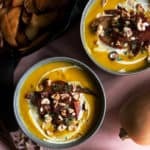 Today I’m combining two fall favorites (apples & squash) to make this creamy caramelized apple squash soup with bacon & hazelnuts. As I’m writing this, I’m cozied up in the softest blanket with an “autumn harvest” candle lit…all while sipping on green tea with lavender honey. It is fall perfection. And also setting the perfect mood for me to be writing about this apple squash soup! Any type of butternut squash soup is definitely a staple for this time of year. The first recipe I created for the blog is still one of my favorite squash soup recipes to date. It’s full of cheddar and sage, with a vibrant topping that has lots of texture. This time, I’m keeping things super simple with some key flavors that make the soup extra special: caramelized apples, bacon, and hazelnuts. 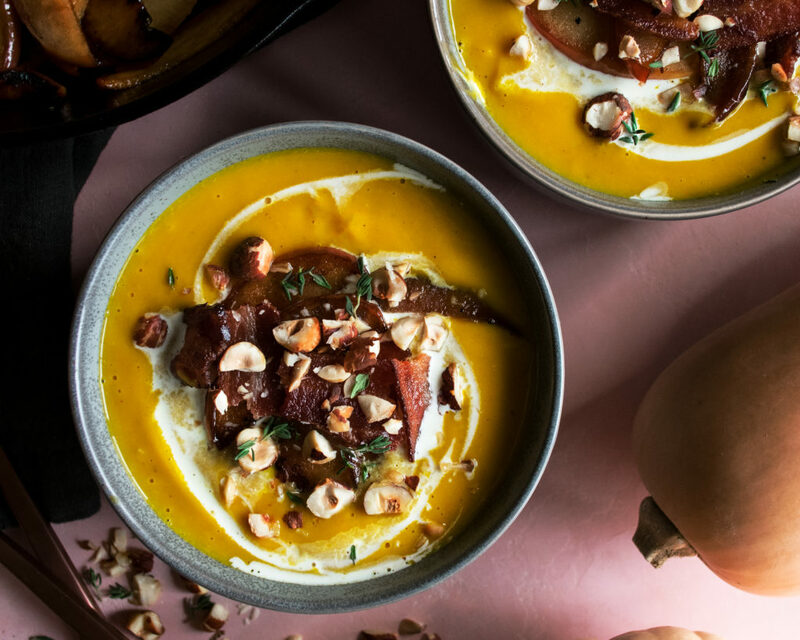 This combination alone is sweet and earthy…but when combined into a creamy squash soup? It’s the most satisfying bowl of comfort I could think of! So there’s apples in the soup, and then I sliced up some more while the soup finished cooking and caramelized them in a pan with melted butter and a touch of brown sugar. Yes, this results in a little extra effort and one more dirty pan…but trust me, it’s worth it. I mean every soup needs a really good topping, right?! The apples combined with salty, crispy bacon, toasted hazelnuts, a drizzle of cream, and a pinch of fresh thyme is perfection. 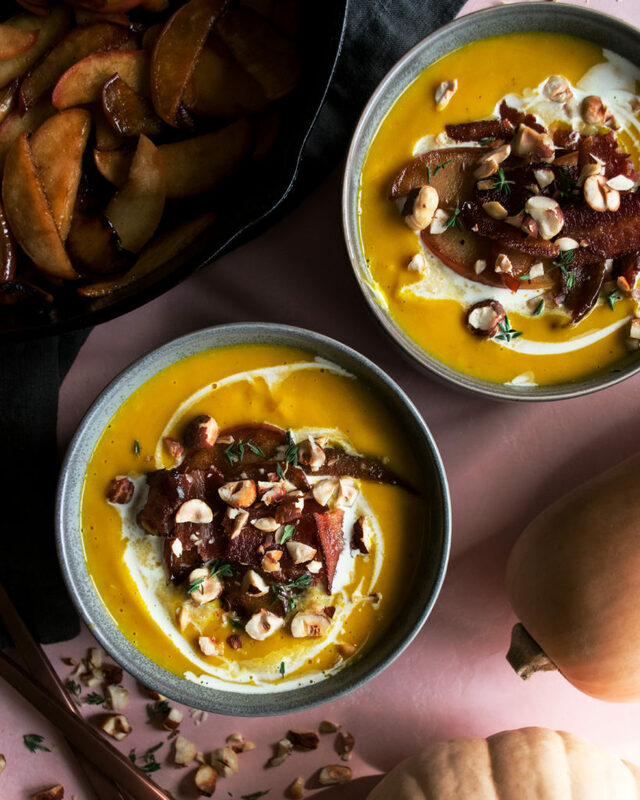 So grab some family or friends, set a cozy fall mood, and have an afternoon of making delicious apple squash soup! YES. 1. Preheat the oven to 350F. Cover two sheets pans with a piece of aluminum foil each. 2. Spread the hazelnuts evenly across one of the pans. Roast the hazelnuts for 8 minutes until fragrant. Let the hazelnuts cool slightly on the pan, just so they’re cool enough to handle. Use a clean towel to aggressively rub the hazelnuts to remove their skins. Roughly chop the hazelnuts, divide them in half, and set aside. 3. Meanwhile, lay the strips of bacon in one, even layer onto the other baking sheet. Cook in the oven for about 30-35, or until brown and crisp. Use tongs to transfer the bacon to a plate lined with paper towels. Set aside. Carefully pour the bacon fat into a small bowl. Reserve 2 tablespoons. Discard or save the rest for another use. 4. Meanwhile, heat a large, heavy-bottom pot over medium heat. Add enough olive oil to coat the bottom of the pot. Add the shallots and apples. Sauté until caramelized. 5. Stir in the butternut squash and half of the chopped hazelnuts. Add the chicken stock, thyme sprigs, and sage sprigs. Bring the liquid to a boil. Reduce the heat to medium-low and let simmer until the squash is tender. Lastly, stir in the 2 tablespoons of bacon fat. 6. Working in batches, ladle the soup into a blender. Blend each batch for 90 seconds until smooth. Season with salt and black pepper to taste. Keep warm until serving. 1. Heat a large sauté pan over medium heat. Add the butter and let melt. Toss in the apples. Allow the apples to sauté until tender and caramelized, but not mush. 2. Season with a pinch of salt and add the brown sugar. Let the sugar melt and coat the apples. 3. Roughly chop the reserved bacon from above. 4. 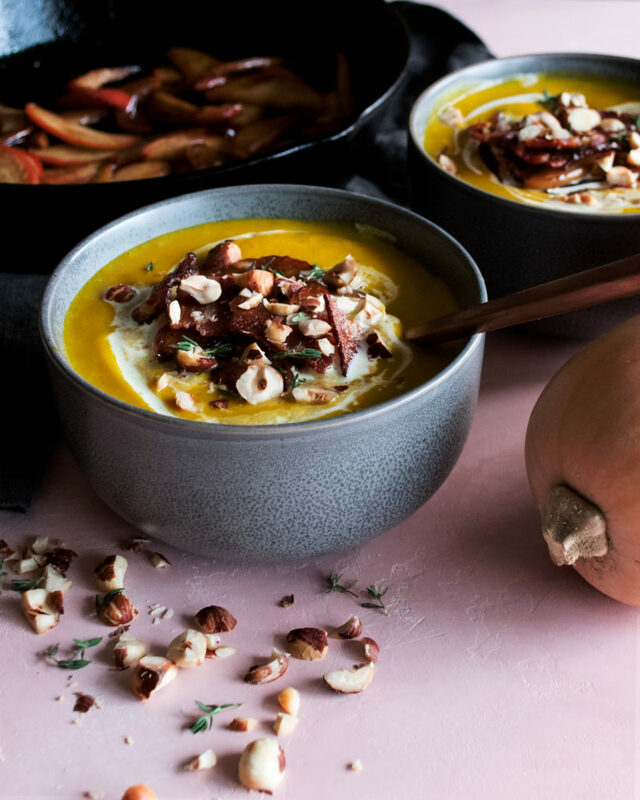 Serve the warm soup with the caramelized apples on top, along with a sprinkling of chopped hazelnuts, bacon, a drizzle of heavy cream, and a pinch of fresh thyme. Even if you’re just making this for 1 or 2 people, I definitely recommend making the whole batch of soup. It stays well in the fridge for about 3 days, which means it’s perfect for leftovers!